It’s been a couple of very busy weeks in preparation for the pool, but the fun, and the digging has begun. Last week we decided more sun was needed in our backyard to help heat the pool so we decided to have a few trees removed prior to the pool work beginning. It worked out well since most of the trees we had removed were not doing too well and were a hazard to our home, but I’m not sure how much more sunlight we actually gained, if any…it seemed like a good idea at the time. The good news is that the pool tile, pavers, and “choice” travertine have been selected with minimal time spent in negotiations. On Monday, the men came and “formed” the pool. All in all, pretty uneventful but I did have a brief moment of concern when I thought it looked rather small. I’m not sure what I expected when we only have so much room in our yard, but I was hoping it went through stages like building a home. Pour the slab and the home looks smaller than it is until the framing is done. I asked the man forming the pool and he gave me a funny look and told me it’s actually 7” smaller all the way around because they leave room for the shell. More concern, but I decided to wait and see. I gave myself a pat on the back for the wait-and see-approach. 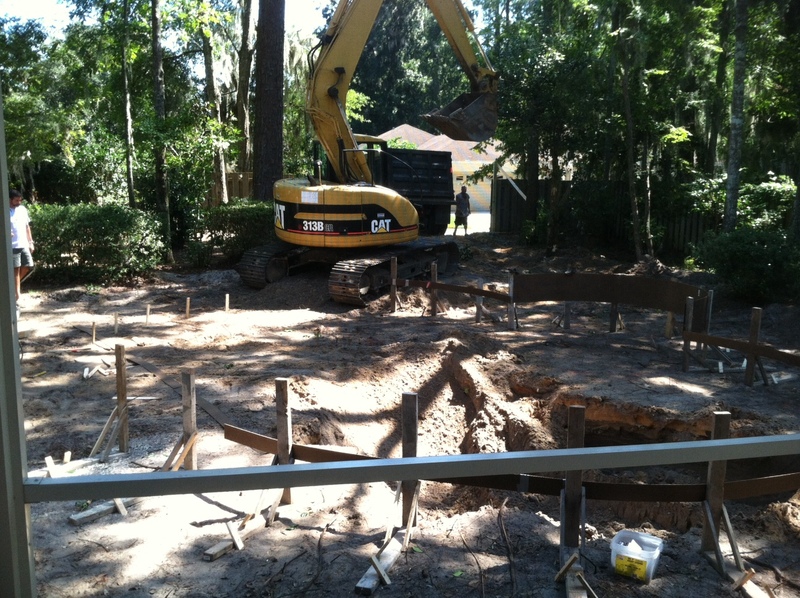 On Wednesday the fun began when the dump truck and excavator arrived to dig. But first, another very small, old tree which they have known about had to be removed to get the equipment in. One small setback when they realize they can’t just knock over the tree as planned because it may, or may not, hit the house. I guess it’s a little larger than anticipated. Off they go to get a bucket truck and a chainsaw. Three hours later and the excavator is finally in place and ready to dig. The excitement from my 3 year old son was contagious! He stood in the window or on the lanai for four hours in amazement asking me what the “bulldigger” was going to do next and if it would still be there when he returned from getting a snack in the pantry 15 feet away. He did not want to miss a thing! As the excavator is completing the dig of the shallow end of the pool I was once again concerned because it looked rather shallow. I had all these calculations running through my head. I knew the man standing in the shallow end wasn’t any taller than I am and the top of the dirt was just below his waist. Just as I was about to inquire a load of stone was dumped. Was I too late with my questions? I stopped the work and was told the depth of the water was 3’. I kindly asked them to make it at least as deep as our neighborhood pool which is 3’5”. Not too many unhappy faces but it did waste a bit of stone and about 30 minutes. I’m just so happy our pool designer understands my last minutes changes and isn’t visibly upset. It’s getting late and the excavator is completing the dig of the deep end. Unfortunately at that point, they hit water which was expected but the swim shelf they dug out on the side of the pool collapsed as did a small portion of the wall in the deep end. No worries, they’ll just shoot additional cement at a cost to rebuild those areas. Most everything went as expected with only a few bumps along the way. A pump was connected to PVC pipe to pump seeping water from the deep end out of the pool until they return to install the steel on Monday. If they were to leave the hole in the ground without the pump, the water would eventually cause the walls to collapse. Once the steel is completed, they will “shoot” the pool with cement to create the shell. The pool and hot tub are really coming along and we’re excited to see the next few stages of its development. Is anyone ready to begin the process of having their own backyard oasis?